Middle Georgia Volkswagen Classic Car Show, Camping (tent/cabin options), VW Swap Meet, Activities & Games, Raffles, Contests, Prizes, Vintage & Retro Items, Food, Music, Family-Friendly Fun, & Much More! 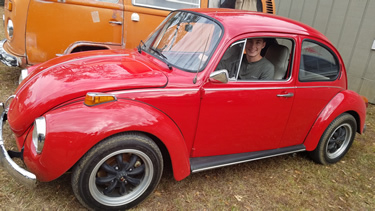 C'mon out to Middle Georgia's favorite VW Classic Car Show! The show is at Camp Christian in Gordon, GA, not too far from Macon. It's always a great time with friends and family-- and you'll meet friends who become like family! If you have a bus, there's camping available, and if you want to spend the weekend but don't have a bus, we have cabins on-site that are affordable and fun, complete with all the creature comforts you would want or need. We also have a swap meet as well, so you can come and buy parts for your ride if you need them. Camping is open on a first come, first serve basis and is primitive with no hook ups. Cabins available on request. Depart: Late as noon on Sunday November 21. Cabins have showers and a nice bed! Continental Breakfast included in both! Yep, we'll have a swap meet on site for those parts for your car that you have to have. Contact us if you would like to register for a vendor spot while they last! If you would like to be a vendor, and have something else to sell, please let us know as we have vendor slots available for other than car parts, like food trucks, we have a thrift shop, and room for arts, crafts, and shirts too! If you would like to showcase your business or service at the Bugs in the Woods Jamboree, we'd love to have you sponsor the event! You will get a prime space on our 2017 banner, and will be featured in any of our publications. If you'd like to sell any of your VW parts at the show, or if you would like to sell food or the like, we still have a few vendor spots open for the 2018 year so that you can do so. If you're interested, please just contact us and let us know. We'd love to have you participate in what is sure to be a spectcacular event! Special Thanks to our Existing Sponsors! Please Use Them as You are Able! Here is a map to the Bugs in the Woods Jamboree. Zoom in on the map until you see the Gordon Animal Clinic icon, the Bugs in the Woods Jamboree Red Marker, and the Camp Christian Conference Center (3735 Dennard-Hardy Rd) icon, where the Bugs in the Woods Jamboree will be held. Click the directions link. When mapping your trip, we suggest that you use the main highways (18, 57, or 243 depending on your starting point.) Taking these main roads should keep you off the dirt roads and your cars cleaner. [] *Note: Some DOT signs on the 4-lane may say Fall Line Freeway.